Opinion Has the populist wave crested? 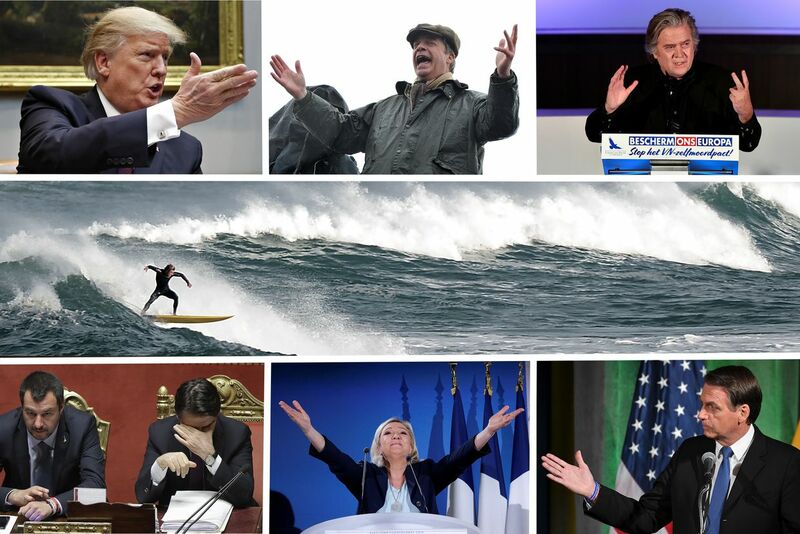 Some of the people who've been propelling the wave of global populism over the past few years. Top: U.S. President Donald Trump, former UKIP leader and Brexiteer Nigel Farage and Mr. Trump's former aide Steve Bannon. Bottom: Italian Interior Minister Matteo Salvini and Prime Minister Giuseppe Conte, French far-right politician Marine Le Pen and Brazilian President Jair Bolsonaro. John Rapley is a Canadian academic, journalist and author based in London. His most recent book is Twilight of the Money Gods: Economics as a Religion and How It All Went Wrong. 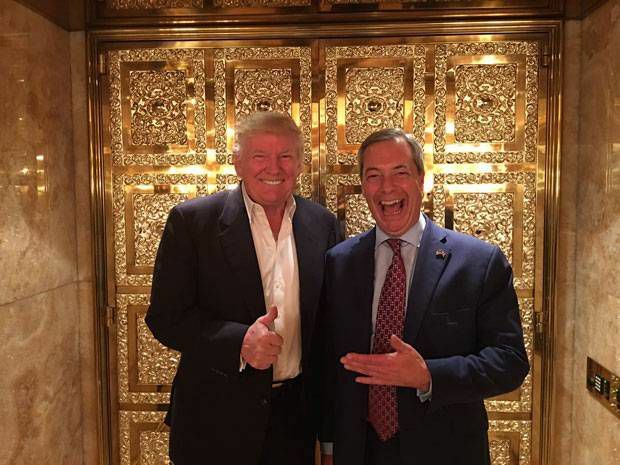 Nov. 12, 2016: Pro-Brexit politician Nigel Farage posts a picture of him alongside Donald Trump, then newly elected as U.S. president, in a visit to Trump Tower in New York. By the time Mr. Trump shocked the world with his own triumph – one even more surprising than the Brexit vote – support for far-right parties in Europe was surging. Early in 2017, far-right leaders gathered at a summit in the German city of Koblenz. Addressing the meeting, France’s Marie Le Pen declared that Brexit had unleashed a wave that would topple “all the dominoes of Europe.” Noting Mr. Trump’s “second coup,” she told the crowd that she was certain that 2017 “will be the year when the people of continental Europe wake.” And indeed, by the end of the following year, right-wing populist parties had made large gains in elections in Germany, the Netherlands and Sweden, and formed governments in Australia and Italy. But for all that, barely three years into the populist surge, there are hints it may now be peaking. To begin with, rather than inspiring other far-right parties to join Britain in leaving Europe, as Mr. Farage and Mr. Trump and Ms. Le Pen all hoped, the chaos and economic damage unleashed by Brexit so far has turned it into a cautionary tale. Today, most of Europe’s far-right parties have taken secession off their agenda. And the newly fragmented Europe that Mr. Farage assumed would crumble before British resolve actually did the opposite. The 27 other states of the EU pulled together, and it was the British government that fragmented. What resulted has been a Brexit so diminished, and destructive, that it no longer serves as a serious model for anyone else (and even for the British, many of whom are starting to have second thoughts about it). Meanwhile, back in the United States, two years into his Presidency, Mr. Trump is on the defensive against a newly resurgent Democratic opposition. His approval ratings, never bubbly, sank further after an unpopular government shutdown. It may just be that the populist tide is starting to ebb. If so, it shouldn’t surprise us. Since the 2008 financial crash, anger at the establishment has thrown up movements on both left and right which rail against elites and champion ordinary people. Political scientists debate heatedly whether the concept of populism can encapsulate such disparate politicians as Mr. Trump and Bernie Sanders, and today’s movements bear little if any resemblance to the original populists of 19th-century Russia and United States. But when it comes to their economics, a common feature arguably runs through all populist movements. It’s that despite all the disruptions they herald, populists don’t actually launch revolutions. Whether of the left or right, they tend to promise bold changes to society while making limited alterations to the economy. Radical populists on the left, such as Hugo Chavez, offer generous social spending, but do so principally by raising the share of economic output allocated to this end. The “pink tide” initiated by Mr. Chavez’s 1998 election, and which elevated a string of populist politicians across Latin America over the next few years, rode the global boom in commodity markets to shower blessings on their supporters. The mirror image to this is the conservative populism of the Trump-Farage camp. They too want to profoundly alter society, not by rushing into a brave new future, but by restoring the ways of the past – restoring the ethnic balance by reducing immigration, or the job market and industrial wages by reversing globalization. But whether of the left or right, populists tend to take for granted the economy of the present. Nobody’s actually out there campaigning for a return to the paycheques, meal options or phone service of the 1950s. But economies are delicate things, and fiddling with the levers always affects the rest of the machine. Fine-tuning is one thing, but once you begin making major adjustments to the distribution of resources, you affect how they’re generated, too. Mr. Chavez taxed the oil boom, but the spending surge constrained the investment needed to keep the industry at the forefront of productivity. So when world oil prices returned to earth, Venezuela was left to do more with much less. Similar pitfalls await the conservative populists now in office. Amid the declining labour supply and productivity of the second half of the 20th century, immigration and globalization were what kept Western economies growing. Remove that oxygen, as right-wing populists are trying to do, and the engine will lose power. 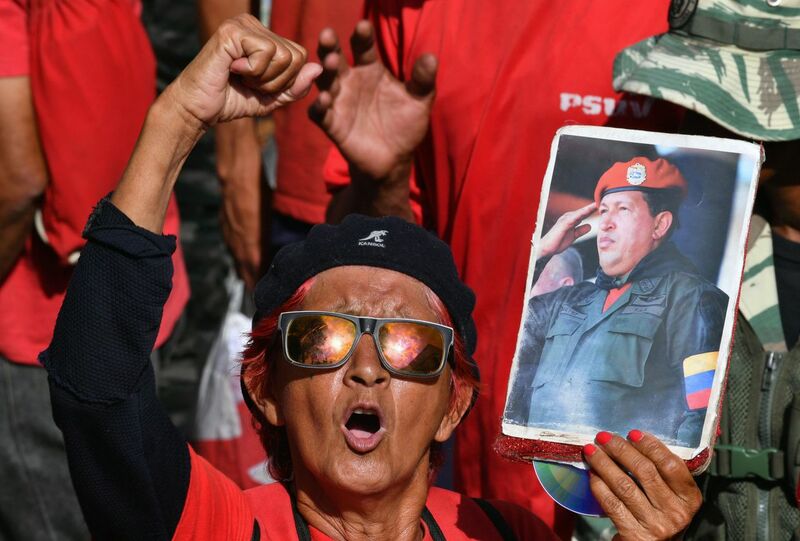 A supporter of Venezuela's President Nicolas Maduro holds a picture of his predecessor, Hugo Chavez, during a rally at the Miraflores Presidential Palace in Caracas. Mr. Maduro's support in Venezuela has fallen sharply after an economic crisis fuelled discontent with the Chavez-era socialist policies that Mr. Maduro promised would continue after Mr. Chavez's death in 2013. 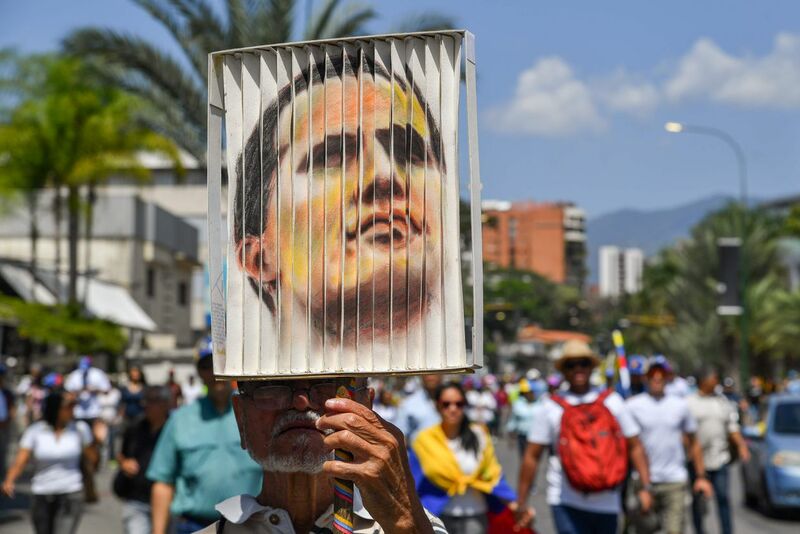 A supporter of Venezuelan opposition leader Juan Guaido demonstrates holding a picture of him as he waits for his return in Caracas. Mr. Guaido has railed against Mr. Maduro's perceived mishandling of the economy, and in January he declared himself acting president after a contentious election. The United States, Canada and a host of other nations have recognized him as Venezuela's legitimate president. Nevertheless, the negative effects of populist economics don’t show up at once. On the contrary, because their policies initially boost spending, they often bring immediate gains, reinforcing the triumphalist narrative offered by those who promote them. But the cornucopia proves shallow. Mr. Chavez’s Bolivarian Revolution was emblematic: Poverty declined sharply in the short term, all while the foundations of long-term prosperity were being undermined. Populist economics doesn’t generate new income so much as run down savings: The faster we grow today, the slower we grow tomorrow. We can see this sort of wax-and-wane cycle playing out in the various experiments now under way. Take Brexit Britain. During the referendum campaign, almost to a person, economists warned a vote to leave the European Union would damage the economy. Leave campaigners derided their warnings, calling them “Project Fear.” When after the vote the economy didn’t tank but actually seemed to gain speed, the Brexiters’ mockery seemed justified. But funnily enough, this apparent evidence of success also actually vindicated the Cassandras. Straight after the referendum, the pound sterling plunged on world markets, and it has remained low ever since. Britons travelling abroad that summer, able to see the impact as soon as they reached the airport currency exchange, understood that higher prices were in the pipeline. The late-2016 surge in spending which resulted appears, at least in part, to have been planned expenditure they brought forward to beat the price increases coming the following year. Sure enough, when inflation rose in 2017, the economy slowed. The immediate payout promised by the Brexiters has thus yielded to vaguer assurances that the benefits may take a tad more time to materialize than initially thought – one prominent Brexiter recently guessing that 50 years should about do it. Um, yeah. 2018 didn’t quite go to plan. The stock market fell and by year-end, the economy was slowing down. Although Mr. Trump promised a bold new wave of investment would result from the tax windfall, in fact, little new business spending followed. Instead of raising the productivity of labour, businesses just raised prices. Meanwhile, the administration’s crackdown on immigration has restricted the growth in the labour supply, nudging up wages. But since investment has not kept up, labour productivity is not rising fast enough to meet this new growth, further aggravating inflationary pressures. Add it all up and you have a cocktail of rising prices and, with that, interest rates, all while the sugar buzz of the tax cuts wears off. By the time Mr. Trump heads for re-election in 2020, the economy may even be in recession. MAGA hats may be going for a bargain then. 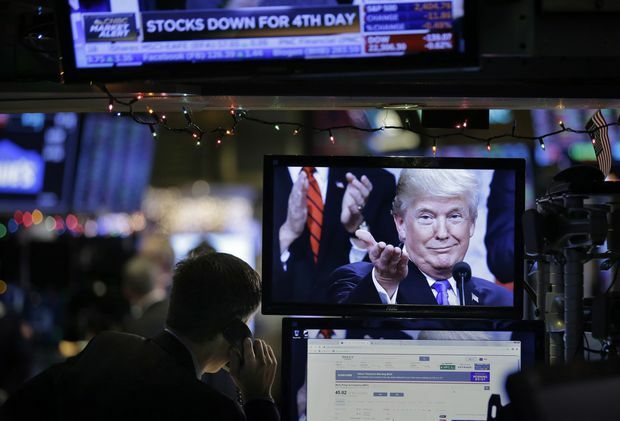 Christmas Eve, 2018: A computer at the New York Stock Exchange shows TV footage of Mr. Trump, while another monitor shows news of trouble in the stock market. One can anticipate a similar cycle with populist experiments elsewhere. Italy’s new government, which blends right-wing immigration policies with left-wing economics, has tabled a budget intended to boost spending and thereby jolt the country’s moribund economy back to life for a couple of years. After that, given persistent structural problems in the country’s economy, things will almost certainly fizzle. Meanwhile, in a country with a rapidly aging population, the government’s naked hostility to immigrants will only worsen the country’s economic plight. In effect, the populist economic strategy is to spend today, pay tomorrow. Instead of altering the way economic gains are distributed by changing the way they are produced, as truly revolutionary change would do, populists rain down manna on supporters by raiding an existing stock of wealth. Sooner or later – and it’s usually pretty soon – the bill comes due. 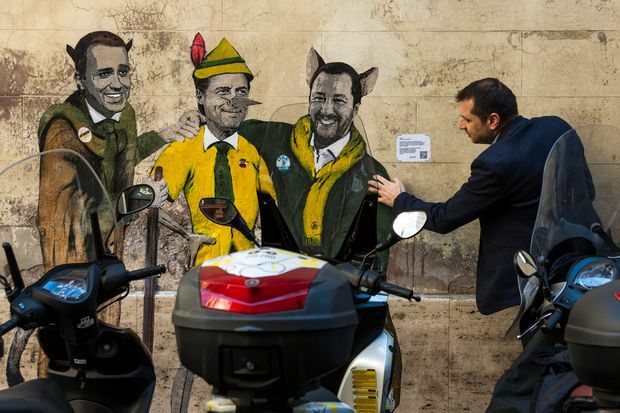 In downtown Rome, a man touches a mural by Italian street artist TvBoy entitled "The cat and the fox" showing Italian Prime Minister Giuseppe Conte, middle, as Pinocchio, flanked by his deputy prime ministers Luigi Di Maio and Matteo Salvini. Their populist coalition government came to power last year. The problem is, only a small minority of Britons are actually tempted by images of huddling by candlelight in underground stations, let alone the thought of foregoing their Mediterranean winter breaks. Many soft Brexiters only signed on after hearing the likes of Boris Johnson say they’d have their cake and eat it, too. As the economic cycle runs out of steam, their support will soften. So it will go for Trump supporters who believed they could both lock up Mexicans and still get cheap food at the supermarket, or Italian voters who imagined they could send all the immigrants packing then take early retirement. Once you eat the cake, there’s no cake left. You’d think an Oxford or Wharton education would teach you that. FILE PHOTO: Anti-Brexit protesters hold up a sign and a model prop boat outside Downing Street in London. With several countries, Canada included, holding elections this year, and with Brazil having just installed a new Trump-loving President, the tide of conservative populism hasn’t run its course. But current polls generally suggest that the kind of shock results we saw in the early stages of the wave may now be largely in the past. The increase in seats Europe’s right-wing populists are expected to make in May’s elections will amount to just clocking the gains in support made early in this cycle. Polls suggest the surge lost momentum in recent months, though. And as the populist economic cycle wanes, the conservative tide will ebb. Mind you, things will never go back to the way they were. As with any wave, once it retreats, what was stirred up on the ocean floor will remain on our political shores. People energized and engaged by the populists have found their voices, and will not now withdraw to the background. Questions about culture and identity raised by conservative populists won’t be answered with a few economic programmes, as many on the left would like to do. Besides, a new wave has been gathering on the left. While the headlines from Europe have trumpeted the rise of the far right, in several countries, more significant gains have been occurring on the left, among Greens or new populist parties. In Britain, the only thing holding the fractious Conservative government in place is Tory fear of a newly radicalized Labour opposition. And in the United States, a crop of left-wing Democrats has entered the House of Representatives, pushing an ambitious agenda of wealth taxes, universal health care and a Green New Deal. It remains to be seen if what this revitalized left offers will usher in a fundamental transformation that will re-engage people in the political process, or simply a sort of Populism 2.0. They may substitute minimum-wage laws for roundups of immigrants in their campaign to raise living standards, but it is not yet clear the new brand of leftist is doing anything more to tackle the fundamental challenge facing Western societies: how to maintain a society that best serves all its citizens in a context in which economic growth is slowing, and will continue slowing. For each Trump-like populist imagining that tax cuts and deregulation will restore the growth rates of old, there is some left-wing populist saying his or her country is just one Keynesian stimulus-package away from the days everyone got a decent job. It’s going to be a bit trickier than that.